Letters written to Little Caesar Enterprises Inc. While I understand your line of business is about reaching as many people as possible to generate income through your ads, I also understand that responsibility for one’s society, care of others’ beliefs, respect and admiration for others of goodwill, are not concerns that one simply sets aside for one’s own financial gain. If you have goodness in your heart and if you honestly feel you do good for this society, you will seek what’s right, and supporting Leah’s hatred is NOT right. I would like to express to you my strong personal objection to your subsidizing with your advertising dollars the program of Leah Remini and A&E. You are wittingly or unwittingly engaged in a hate campaign against my religion. Leah Remini is falsely representing the Scientology religion on national television viewers. This isn’t about the beliefs of the Church or any of the “issues” portrayed—this is an effort to harm and destroy the Church of Scientology by any means. 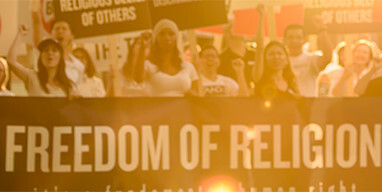 Whether you agree or disagree with what you hear in the media about Scientology (which is mostly based on false data or an incomplete understanding of Scientology), you surely are aware that every citizen in America has a right to choose their own religion and should not be discriminated against because of their beliefs. I’m sure you know of someone who holds a religion dear to their hearts. Why should they be attacked for believing in something they feel can help others? I need not remind you of such basic human rights. I earnestly ask you to reconsider your support of this hatemonger. She’s doing nothing but generating hatred toward Scientology. That hatred should not be given a platform, just as neo-Nazis would not be given a national TV show. There is enough confusion, misunderstanding, instability, chaos and problems in this world—is it really necessary for you to be supporting more hatred? Has hatred ever brought peace? While I understand your line of business is about reaching as many people as possible to generate income through your ads, I also understand that responsibility for one’s society, care of others’ beliefs, respect and admiration for others of goodwill, are not concerns that one simply sets aside for one’s own financial gain. If you have goodness in your heart and if you honestly feel you do good for this society, you will seek what’s right, and supporting Leah’s hatred is NOT right. Please stop supporting Leah Remini and A&E.